The perfect accessory for your FPV system! 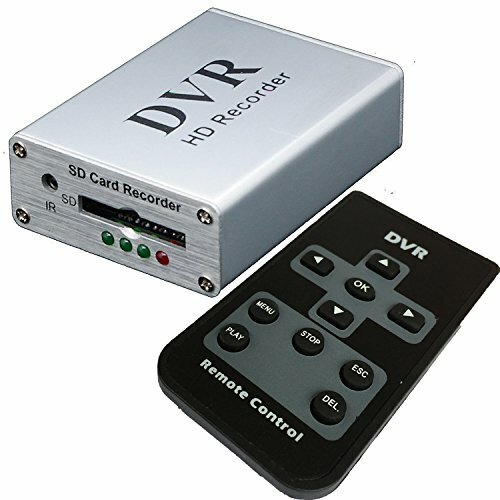 This SD DVR (Digital Video Recorder) allows you to easily record everything you see and hear from your FPV model's camera directly to an SD card. This eliminates the need for bringing your laptop to the field for video recording. This device features and A/V input and output allowing you to connect it in-line with your vehicle system. The input source will be recorded directly to the SD card, while the A/V output will carry the signal on to your TV, monitor or FPV goggles. The SD DVR even includes an IR remote control for easy setting adjustment such as resolution, video quality, volume, timer functions and more. The menu system will be displayed via the A/V output to your TV, monitor or FPV goggles. Get all refund in 30 days and replacement in 99 days. 2 Years warranty by Gracetop. Support 32 GB SD card to record 7-8 days continually. Smaller size-- 60*45mm for FPV system, View in 704 x 576 pixels to get real time videos on TV. Support manually snapshot, motion detection and auto record. Best After-sale Service: 1-Year Replacement Warranty and Lifetime Support Guarantee! Please contact us directly if you have any questions. If you have any questions about this product by GRACETOP, contact us by completing and submitting the form below. If you are looking for a specif part number, please include it with your message.